This spaghetti recipe with simple marinara sauce means tasty menu on the table in less than 30 minutes. Quick and always favorable. Put the water into the pan and wait until it boils. Add the spaghetti. Mix well until all parts of the spaghetti are submerged. Cook until cooked. Turn off the heat and lift the pot from the stove. Strain the paste and add oil to keep it from sticking to each other. Heat the oil. Saute onion, shallot, and garlic. Add the shrimp and squid. Stir well. Put the button mushrooms and mix well. Add Knorr Tomato Pronto, mix well. Wait until boiling then add the pasta, and mix well. Add black pepper, salt and Knorr Chicken Powder. Add the basil Leaves that have been sliced. Turn off the heat and lift it from the stove. 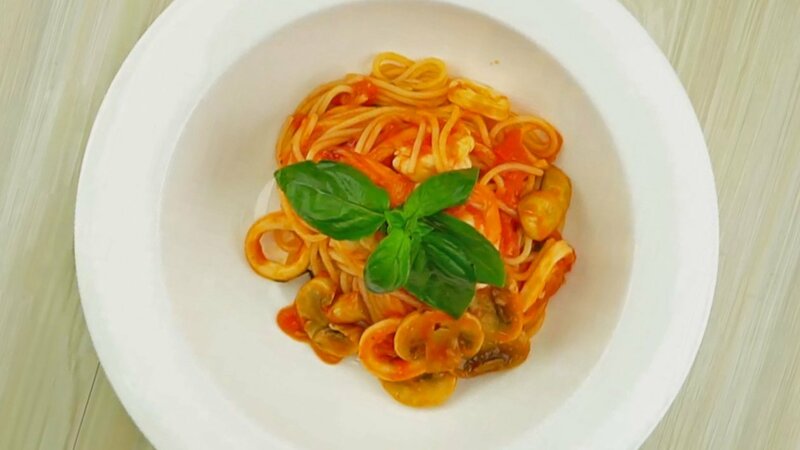 Put pasta on a plate and garnish with basil leaves.